Tibi, Maria and Fabio presented Open Science Practices at the CSPC2017. The panel on Open Science was split into two sections, The Scientific and Economic benefits of Open Science and Open Science and Innovation (our section). 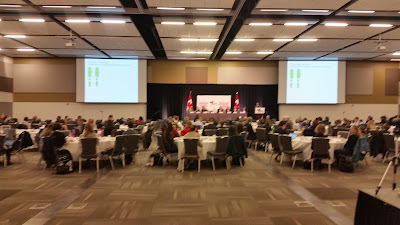 During the first part of the session, Guy Rouleau (Chair of the Department of Neurology and Neurosurgery, McGill University) spoke about MNI and their bold action to move to open science. The open science concept in the first part was presented as a more open collaboration between academia and the private sector, where no patents were pursued. This is the institutional view of open science, a more top down approach, supposing that scientific development comes from academia and the private sector puts new scientific knowledge into practice. A representative of the multinational pharmaceutical Merck was part of this first panel, testifying why large companies are interested in open science and open innovation. In essence, for rare medical conditions that don't represent a large market, Merck is happy to work in an open way to reduce the costs of treatment development, while hoping to monetize the solution. During our part, we extended the definition of open science beyond open publication and the creation of commons and of open source technologies. These concepts are captured in a presentation that we made for MNI in 2016. We also approached the question from a practical perspective, presenting Breathing Games and some of the SENSORICA's past projects. But most importantly, we established the existence and the importance of open networks (the crowd/people) as new socioeconomic agents with a very important role in science and innovation, proposing private-public-people partnerships. We introduced the button up view, advocating for a better interface between the crowd (open networks) and the public and private sectors. See more on this event. See more on SENSORICA's Open Science activities.